Yoon Ha Lee wraps up his stunning Machineries of Empire trilogy with all of the style of the first two volumes. Both the eye-opening Ninefox Gambit and its satisfying sequel Raven Stratagem were shortlisted for the Hugo Award (Lee’s debut was shortlisted for pretty much every award going). And it will be no surprise if Revenant Gun joins them. The third book of the trilogy takes the universe and characters that Lee created in these earlier books and once again twists them into new shapes. Being a mathematician, Lee seems to be constantly finding new answers to the same equation. At the end of Raven Stratagem the status quo of Lee’s universe has been seriously upended. The calendar-based system which powered the universe has been overthrown, many of its architects (the hexarchs) are dead and chaos is threatening to flow in their wake. Revenant Gun jumps forward nine years from that point – the former empire is split in two, and an ancient enemy is rising, keen to see the status quo re-established and for the universe go back to the way it was. Saying too much more about the plot would invite more spoilers. Suffice to say that Lee uses this book to revisit his two main characters from the previous books, Shuos Jedao and Kel Cheris. Each book of the series has dug into these two characters in a different way. Revenant Gun has Jedao in another fascinating permutation with his 17-year-old consciousness placed in his fully adult body. But Lee also has plenty of time for a number of other point-of-view characters, including Kel Brezan, introduced in Raven Stratagem, and a robot servitor called Hemiola who goes on her own journey of discovery. Ink paintings on heavy silk depicted birds in migration, only when he looked more closely, the black strokes that formed the birds’ wings were composed of tiny, impressionistic moths. The halls abounded with displays of orreries and astrolabes, abacuses with beads of jade and obsidian. And they were walking on carpet, iridescent gray (with patterns on it in paler pearly gray), with pile so deep that if you lost a toe in it you’d never see it again. ‘You have reservations.’ [Brezan] could tell from the deepened lines around her mouth. ‘Burn brightly,’ she echoed and signed off. The shear cannon. It caused ripples in spacetime, displacing objects caught in the area of effect. Not precise enough to yank moths into the path of fire, but good enough to disrupt Kel formations, which depended on precise geometries. Jedao almost looked forward to using it. 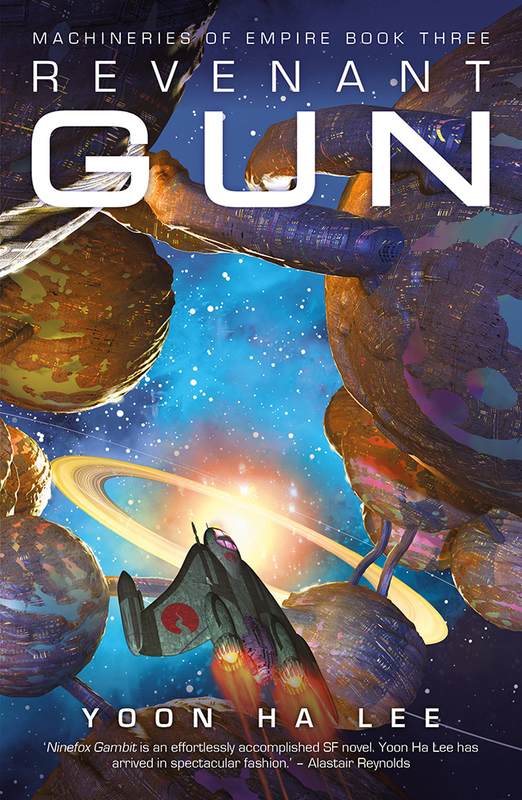 Revenant Gun has all of the trappings of modern space opera that have been wielded so effectively recently by exponents like Iain M Banks and Ann Leckie – including complex politics, a reconfigured society, snarky independent robots and sentient space ships. Lee’s mathematics-driven universe, combined with the way he tells these tales, has its own uniqueness, which sets him apart. But as with those authors, despite all the strangeness of the setting, there is a humanity to the characters and their concerns. So that once again, on top of all of the verbal and descriptive flourishes and the military science-fiction styling, Lee has delivered a deeply humanistic tale that furthers the concerns of the previous volumes of the series but does not feel repetitive. Revenant Gun wraps up the Machineries of Empire series well. While there are possibly more permutations Lee can put his main characters through, it is probably time to let them settle, even if the future of this universe remains ambiguous. Because life, even in a mathematics-driven universe, does not always have easy answers.